- Take Charge of "1,000 SOULS"
For centuries, our cherished Catholic faith has been passed from person to person, parent to child, etc. Each of us carries in our heart a special memory of how God first graced us with the knowledge of the faith and how Our Blessed Mother, St. Philomena, Venerable Pauline Jaricot and other saints changed our lives and brought us closer to Christ. In our work in the Universal Living Rosary Association, we see first hand how millions of souls are currently living without that knowledge of God and are living outside of His grace. We have been given a beautiful opportunity to carry out Christ's work and pass on our faith and blessings to others who would otherwise never be introduced to Our Lord, the Savior of all mankind. Just as we pray for the souls in Purgatory who have no one to pray for them, we should also make it a part of our life's mission to pass on our faith to as many souls as possible who have no one else to pass it on to them, who don't know Our Lord and His promise of salvation. This is the box we send out to the foreign Missions @ $77.95. It contains Rosaries, Scapulars, Miraculous Medals, Cord & Oil, Newsletters, Calendars, Catechism books, 2 TAN books, large color prints, lists and encouragement for our Promoters. Take Charge of "1,000 SOULS"
With your donation of $100.00 we can send 1,000 Miraculous Medals on behalf of you or your organization, church or group to one of our Missionary Centers to distribute to a poor community near them. Your donation will cover both the manufacturing and processing of the medals and also the cost to ship. Our Missionary Center director will give your medals out; you will then be responsible for 1,000 new souls being put in the care of Our Blessed Lady's protection. And they will be given your name and when you die those individual "1,000 SOULS" will pray for you. Following the example of the Venerable Pauline Jaricot, who founded the work of "a penny a week" for the Propagation of the Faith, you and your family may also consider dedicating monetary support equivalent to a meal a month or other offering to the Living Rosary. The majority of the members of the Living Rosary are in third world countries. 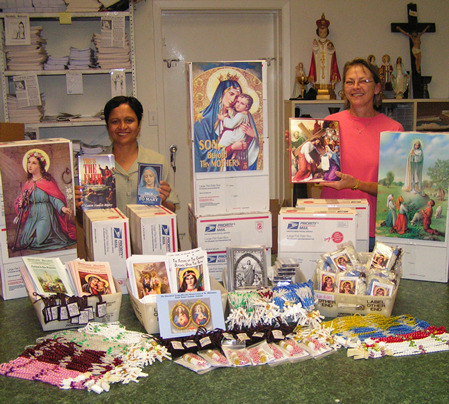 Every donation received goes directly back into this universal and heroic missionary effort through the distribution of Catholic literature, holy cards and sacramentals such as the holy oil of St. Philomena. Universal Living Rosary Association of Saint Philomena is a nonprofit Corporation 501(c)(3) charitable organization and as such we automatically give "Tax Receipts" to all those who make a financial donation. For those who donate $100 or more, a "TRIDUUM of MASSES" will be arranged for the donor and his/her family. Thirty dollars of every $100 donated supports the missionary who will offer these masses. Through your help, the prayers of the missions will continue to work miracles in the lives of all of its members and families, thus strengthening the Mystical Body of Christ. Another option is to donate $50 to cover the flat rate to send a parcel of materials and sacramentals to the missions abroad. God bless you for your generosity. P.O. Box 1303, Dickinson, Texas 77539, U.S.A.